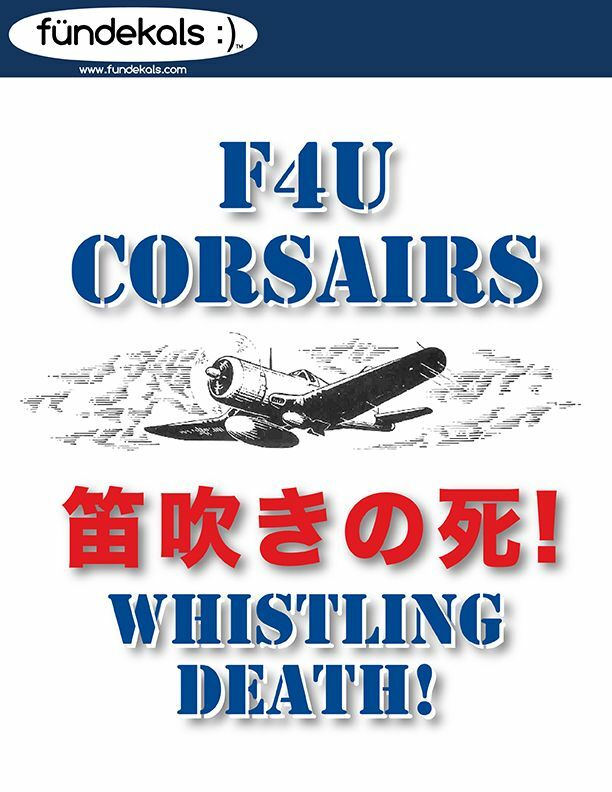 Our new F4U project is on the way, and we hope to have them (we *REALLY* hope to have them) in time for Phoenix. It might be cutting it close, but we've got fingers crossed. The instruction manual is now at 44 pages, and as always, will be available for download from our web site regardless of whether you purchase the decals or not. We've uncovered some material on markings and hardware that we don't believe anyone has seen before, and there's even more that will have to go into our next F4U project coming up. Can't wait to see what you have Jennings. Any chance you have the answer on Robert Hampton Grey's Corsair? I'm going the masks route if Maketar releases their version of the 1D soon, but I will still buy your set for the documentation which is always excellent. No, and frankly it’s such a fraught, contentious issue that we’re steering clear of it. For simply suggesting the possibility that existing “facts” might not be facts at all, I was called all sorts of names by ‘experts’. The sheet has F4U-1As, FG-1s (equivalent to the F4U-1A), F4U-1Ds, and FG-1Ds, including an FG-1 (F4U-1A) in factory applied Gloss Sea Blue. There are 14 different subject aircraft, along with lots of documentation and photographs. Excellent! Sign me up for 1. That's unfortunate about the name calling. Well, I'm still looking forward to this release as I've got a few Corsairs in the stash. If we somehow uncover incontrovertible proof, we might revisit, but we’re not pursuing it right now. Hi Jennings - on a slightly different subject, with the forthcoming release (Hopefully it'll happen this time!) of the 1/32 TF104 by Italeri, is there a chance you'll find time in your busy schedule and set to and release some JASDF generic and squadron markings as you "threatened" some time back?? I for one would be deeply appreciative! I agree with Carl from Toronto, there's certainly never any need for name calling in this hobby and on this website, so apologies for your unfortunate experience! I’d like to do the JASDF 104s, but it will take a bunch of work that isn’t going to happen anytime very soon. Sounds like a long time off, if ever but boy that sure would be a cool set. Id be down for a sheet for the forthcoming TF for sure. Ive always loved the way the JASDF 104s look, and have paint masks for 207 Sqn 26-5001 in 32nd but sourcing the stencils and other bits has proved allusive so far, with the previously released special edition Hasegawa kit being rarely found. To be clear: if/when I do them, they’ll only have the barest minimum of stuff other than the squadron markings and special stuff. I’ve done things like the rescue arrows that are in Japanese, but not a full set of stencils by any stretch.